Clinical leaders are being urged to maximise the quality of care in their team or unit by reducing unwanted variation in the delivery of therapeutic or preventative regimes that patients receive. Increasing the reliability and safety of healthcare delivery maximises the chances of optimum patient outcomes and reduces the risk to clinicians and healthcare organisations of complaints, claims, adverse publicity and accreditation or regulatory body censure. This workshop empowers clinical leaders to examine and enhance the modes of healthcare delivery utilised within their team or unit applying to the science of reliability. lessons that can be learnt from non-healthcare high reliability systems. 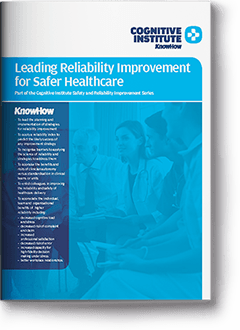 The Leading Reliability Improvement for Safer Healthcare workshop is ideal for clinical leaders. To fulfil these roles, clinical leaders require knowledge and skills extending beyond their clinical expertise into the science of reliability and the academic domains of quality and safety practice. 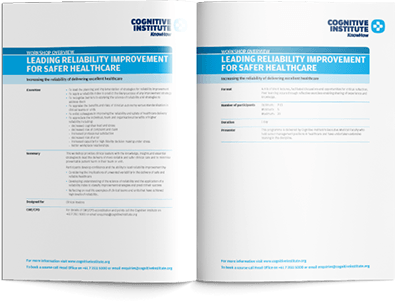 The Leading Reliability Improvement for Safer Healthcare workshop provides clinical leaders with the knowledge, insights and essential strategies to lead the delivery of more reliable and safer clinical care and to minimise preventable patient harm in their team or unit. reflecting on real life examples of clinical teams and units that have achieved high levels of reliability. increased capacity for high-fidelity decision making under stress. Increasing the reliability of delivering excellent healthcare.